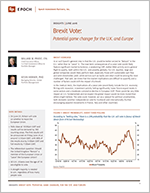 Brexit Vote: Potential game changer for the U.K. and Europe - Epoch Investment Partners, Inc. In or out? Epoch’s general view is that the U.K. would be better served to “Remain” in the E.U. rather than to “Leave” it . The near-term consequences of a Leave vote would likely feature significant market turbulence, a weakening GBP, stalled M&A activity and a general flight to quality, both within the U.K., and possibly globally. For U.K. equities, large and global companies would likely perform best, especially those with sustainable cash flow and solid shareholder yield, while sectors such as banks and retail could be among the most challenged. That said, we stress that the market implications are difficult to quantify and a number of factors could shift the impact of a Brexit. In the medium term, the implications of a Leave vote would likely include the U.K. economy flirting with recession, investment activity falling significantly, lower future export levels in some sectors and a moderate cumulative decline in European GDP. There would be very little impact on U.S. fundamentals and we expect the global impact would be more muted than others might believe. The vote could, however, act as a catalyst for political uncertainties, both domestic (another independence vote for Scotland) and internationally (further encouraging populist movements in France, Italy and other countries). On June 23, Britain will vote on whether to leave the European Union. Polls close at 10:00pm GMT and results will be declared by 382 counting areas. The first results will be announced on Friday June 24 at around 12:30am GMT, with 80% of the results due by 5:00am GMT and full results by 7:00am GMT. The referendum question: Should the United Kingdom “Remain” a member of the European Union or “Leave” the European Union? All U.K. citizens over the age of 18 are eligible to vote. A straight majority is needed to win, regardless of how many people vote. Polls have been pretty steady over the last ten months, with “Leave” and “Remain” voters now in a dead heat; however, 12% remain undecided. If the U.K. decides to exit the E.U., the short-term impact seems uncontroversial: greater uncertainty, significant market turbulence, a weaker currency and, probably, less investment. Although popular polling suggests a very close vote, the “bookies” are suggesting a 72% probability of remaining, and we would argue that the currency is suggesting the same outcome. If Remain wins the day, the currency will likely rally a bit, from 1.47 to perhaps a bit over 1.50 (GBP to USD). However, if the vote is to Leave, then we would predict a decline of 10% to 15% is possible. Given the negative implications Brexit would pose for the European project, the euro would likely also decline, but by a smaller amount (say 3% to 5%). Further, U.K. equities would probably fall moderately. Within the domestic stock market, large and global companies would likely perform best, especially those with sustainable cash flow and solid shareholder yield, while sectors such as banks and retail could be among the most challenged. It seems reasonable to expect a general flight to quality (within the U.K. and possibly globally), with M&A activity stalling (e.g., the Deutsche Boerse/LSE deal falling apart). Specs were very short GBP earlier this month, but closed half of their positions two weeks ago and, given recent price action, are probably close to -20 today — just slightly below the five-year mean of -13. The implied volatility of the GBP has soared. Even three-month volatility is two times normal levels, while one-week volatility was 42% on 6/22/16, down from an eye-popping 48% on 6/17/16. Realized volatility on the FTSE has also been ramped up and is exceeding SPX volatility by the highest level in seven years. U.K. large caps have outperformed small caps due, in part, to the fact that they are more global and hence, less exposed to a Brexit. Staples and energy have outperformed, especially relative to discretionary and finance, with similar trends occurring in other regions. Lower for longer — U.K. and global yields have been driven lower by fears of Brexit (and China and …). A vote for Brexit would create enough turbulence to encourage the BoE to cut and to halt Fed hikes for the next few quarters. Having discussed the potential impact of a Brexit on the GBP, U.K. equities and bond yields, we now examine how much exposure U.S. companies have to the U.K. economy. The bottom line is not a whole lot. To illustrate, as seen in Figure 10, the aggregate revenue exposure of the S&P 500 to the U.K. is only 2.9%. At the sector level, the Energy (6.4%), IT (4.0%), and Materials (3.7%) sectors have the highest revenue exposures to the U.K. This suggests that while Brexit would certainly create serious market dislocations in the U.K. and roil European markets, its impact on U.S. fundamentals and markets would likely be modest. The economic implications of a Leave vote would likely include the U.K. economy flirting with recession as GDP declines by a cumulative 2 to 3 percentage points. While this is a very rough estimate, the direction is completely clear. In addition, investment activity and Foreign Direct Investment would fall significantly, at least until the level of uncertainty normalizes. Exports would likely be lower than they would otherwise be, but this would only start in 2018 or 2019 and would mainly impact services such as financial, legal, marketing. Finally, we would expect a modest cumulative decline in European GDP (say 0.2 to 0.4 percentage points). Outside of Europe, there would be very little impact on the fundamentals of U.S. or global markets. A key to understanding the potential impact of a Brexit vote is appreciating the decisions and negotiations that would take place following the vote. Prime Minister David Cameron says that if Britain votes to Leave he will immediately invoke Article 50 of the Lisbon treaty, which sets out the rules for negotiating a member state’s departure. That would give the U.K. and E.U. two years to finalize a deal. This timetable can be extended, but only with the consent of all concerned. If no agreement were reached, Britain would have to fall back on trading with the E.U. under WTO rules, which would imply tariffs and no special deal for financial services. At the other end of the range of options is a deal in which Britain, while leaving the E.U. in accord with the referendum, remains part of the E.U.’s single market. This is the arrangement Norway has, by dint of the European Economic Area. Switzerland, though not a member of the EEA, has something similar. In Norway’s case, however, the deal means accepting the free movement of labor and observing almost all E.U. regulations, while having no say in writing them. Plus, Norway contributes heavily to the E.U. budget for this privilege. It is difficult to imagine the Pro-Leave campaigners being happy about such an outcome. The U.K. would need to decide where on the spectrum between EEA membership and trading under WTO rules it wants to position itself. This entails a trade-off between greater access to the single European market and reduced sovereignty over regulations, immigration and budgetary contributions. Regrettably, there are no free lunches, despite what many Leave campaigners are currently claiming. Given all the uncertainty inherent in political negotiations, it is impossible to know where the U.K. would end up. This is especially true given that E.U. stalwarts are likely to take a very hard line in order to demonstrate to populists in other E.U. countries that exiting is a bad option. Further complicating matters is the fact that PM Cameron would likely resign almost immediately after losing the referendum. It would then take several months to choose his successor and formal notification to the European Council of the U.K.’s intention to leave (under article 50 of the Lisbon Treaty) would probably wait until then. In sum, not only is there uncertainty about the outcome of negotiations, but there is also considerable uncertainty regarding when negotiations would actually commence. Further, access to the single market is vital for the City of London, which looms very large in the British economy thanks to huge exports of financial services to the rest of Europe. Thus, the economic impact of Brexit would fall quite differently on various groups within Britain. The City and those whose incomes are tied to its fortunes would probably lose badly, but some regions of the country might actually benefit, particularly from a weaker pound. This is reflected in opinion polls which show residents of London favoring Remain by a margin of 51% to 39%, while the rest of England prefers Leave by a margin of 45% to 41%. Finally, pay no attention to claims that Britain, freed from E.U. rules, could achieve spectacular growth via deregulation. This is pure economic nonsense. On the other hand, it is also best to discount claims about an impending financial crisis. The pound may fall, but for a country that borrows in its own currency and has an excessive current account deficit, that’s a good thing; that is unless the currency decline is disruptive, creating losses to some households and businesses, and increasing uncertainty even more. The U.K. economic surprise index has actually held up quite well since the Brexit campaign began just over six months ago. This suggests the economic damage might be less than many fear. Seven of the U.K.’s top 10 trading partners are members of the E.U. — this illustrates the imperative of the U.K. negotiating a new trade agreement within the two-year time-frame. Political Implications of the Brexit Vote, Both Inside and Outside of the U.K. If PM Cameron indeed resigns immediately following a Brexit vote, this would start the messy process of choosing the new leader of a highly fractured and divisive party that is on the verge of imploding (among Conservative Party voters, 55% prefer Leave while 38% prefer Remain). Further, opinion polls in Scotland demonstrate a strong preference for continued E.U. membership, which could lead to a second referendum on independence. This could ultimately lead to the disintegration of the U.K. itself. In addition, a Brexit would certainly weaken the long term goal of a “United States of Europe,” though that goal never made much sense since Europe has a monetary union, not a fiscal one. The former is struggling at the moment in any case. Specifically, it would further encourage the populist movements in Italy (Five Star), France (National Front), Spain (Podemos), Austria (Freedom Party), and so on. This is especially worrisome with so many general elections on the calendar — Netherlands (March 2017), France (April 2017), Germany (September 2017) and Italy (February 2018). Expect political issues to feature heavily again next year and well into 2018. It is difficult to predict the precise impact of a Brexit vote, but, in the near term, it is reasonable to expect negative effects on U.K. equity markets, GDP, the GBP and M&A activity. In the medium term, the U.K. could experience a recession, but not a full-blown financial crisis. The economic impact on other countries would likely be more muted. One might expect that a Brexit vote would act as a wake-up call for the E.U. elite. However, there have been many such calls in recent years, yet nothing seems to happen; Brussels appears impervious to the dissent. The E.U. system desperately needs reform but has shown little inclination in that direction. This is truly unfortunate as, even when the E.U. falls short, like it has when dealing with the rise of authoritarianism in Hungary and Poland, the Union and its institutions are an important restraint. The specter of Brexit greatly damages the European project and it could open the door to even more ugliness across the continent. As such, it is no exaggeration to say that a Brexit would call the European project into question, particularly as there is a widespread view on the continent that Europe is failing to deliver economically as we see in Figures 13 to 15. Views in the U.K. are similar to those in Spain and Germany, and more favorable than France’s. The U.K. is definitely not the only E.U. country that is unhappy with the status quo. Views in the U.K. are in the middle of the pack and certainly much more favorable than those in Spain, France and Italy. This helps explain the success of populist (and typically E.U.-skeptic) parties in these countries. The U.K. certainly does not support ‘ever closer’ union (in fact, very few people do anymore).